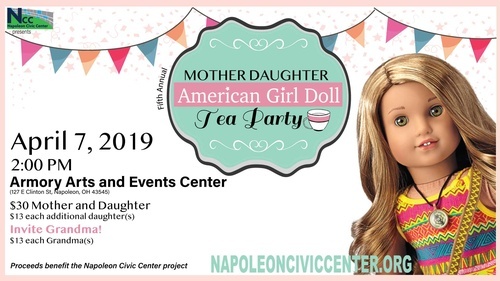 Put on your Sunday best and celebrate the girls in your life by attending the Napoleon Civic Center’s Fifth Annual Mother-Daughter American Girl Doll Tea Party. This year's tea party will be April 7, 2019 at 2:00 pm, at the Armory Arts and Events Center (127 E. Clinton, St., Napoleon, OH 43545). Tickets go on sale via our website beginning on March 1, 2019, until they sell out. This event is for all ages. Pre-registration is required as this event sells out very quickly. All children must be accompanied by an adult. Girls, don't forget to bring your favorite doll or stuffed animal to share in your tea party fun!